I was pretty bummed out about this. I had used online Offers myself a little bit, and I know of many businesses that have found success with it. 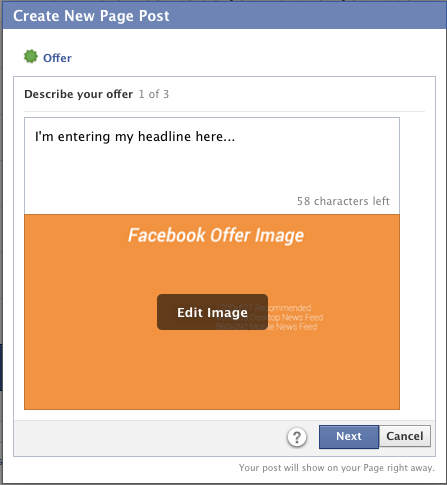 But as Facebook said, I soon noticed that this option was no longer available when creating an Offer from the publisher. Even after the Offer creation process was revamped, the online option was nowhere to be found. Except it’s still available, but just not using the standard Offer creation method. This is one reason I love conducting One-on-One Coaching sessions. I often end up learning something new as a result. And this was a perfect example of that. A client this week mentioned that they were using online Offers. I did a double take. Then I assumed they had something I didn’t. But then I realized I had it, too, and you probably do as well. Not only that, but it’s available both in Power Editor and the self-serve ad tool. I’d say I feel stupid for not knowing this, but it’s completely gone under the radar. So I don’t feel all that bad. If you haven’t created an unpublished post in Power Editor, you had no idea this option was available. And even though I do create unpublished posts, I haven’t even considered creating an Offer since the online option was taken away, so I haven’t looked at that final tab. If you’re using the new Objective flow, choose Offer Claims. 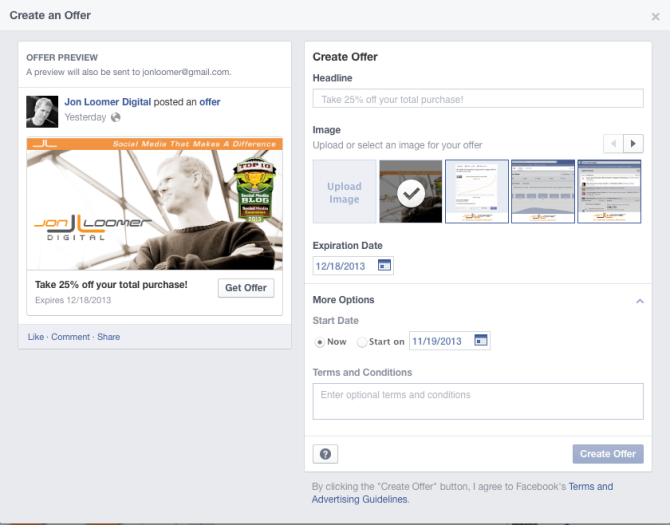 If you’re using the old ad types, select Ads for a Facebook Page Using a Page Post. In either case, you will now click the link for Create New Unpublished Post. The final — and easy-to-miss — option for creating an unpublished post will be Offer. You can complete any of this information. If you’re going to create an online Offer, the items in particular you need to worry about are Redemption URL and Redemption Code. Headline: In a sentence or a few words, describe the awesomeness of your Offer. Image: If you want to optimize your image (of course! ), Facebook recommends 1200×627 pixels. Or you can use 400×209 if it will only go into the Desktop News Feed, 560×292 for mobile or 100×72 for the sidebar. Expiration: When will this Offer end? 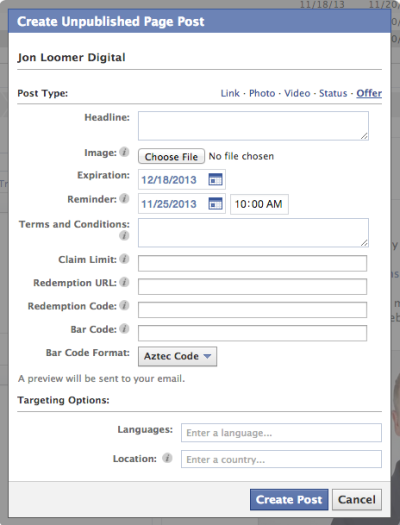 Reminder: Have Facebook send those who claim your Offer an email reminder. Terms and Conditions: Any fine print that should be explained up front regarding exceptions, who can’t claim it, etc. Claims Limit: Are only 10 available? You better make that clear here. 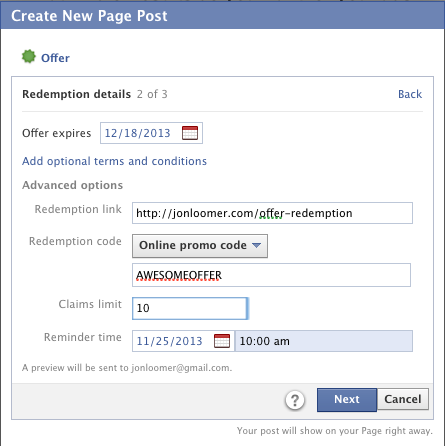 Redemption URL: Where should the user go to redeem your Offer? Redemption Code: If necessary, require a code that users will need to enter in order to receive your Offer. Bar Code: Not applicable for online Offers. Bar Code Format: Again not applicable. Here’s how I may have completed mine. And here’s how that preview looks in Power Editor. Now, you know by now that I’m not a self-serve ad tool kind of guy. I’m Power Editor through and through. However, the self-serve ad tool has seen some improvements lately. And while it still doesn’t stack up to Power Editor, maybe you’re forced to use it for some reason. So here is what you need to know. When creating an ad, choose the Offer Claims objective. Then click the “+” button for creating a new Offer instead of promoting one that was already created. In the first step, you’ll need to edit the image for your Offer and enter a headline (see steps for Power Editor above). 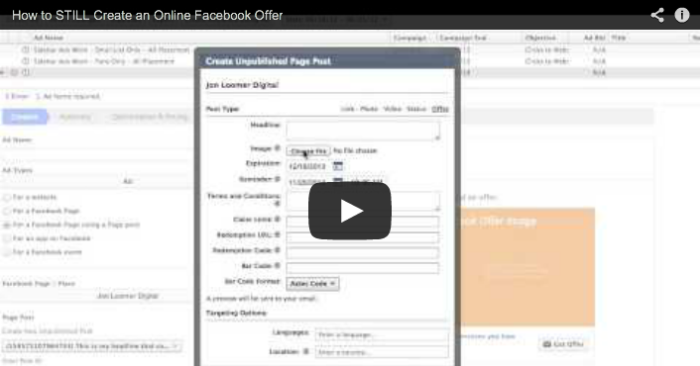 Why Would You Create an Online Offer? This is the perfect time of the year to start thinking about creative ways to give your readers and Fans discounts. 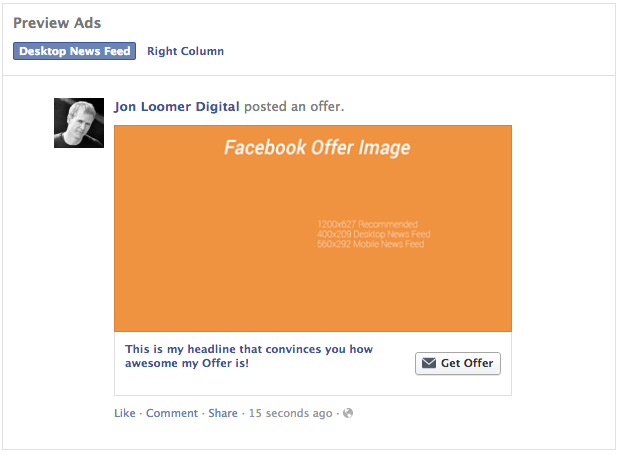 A great way to do that — especially if you run an online business — is through the use of Facebook Offers. Have you been creating online Offers? Will you be? Let me know what you’re planning in the comments below!